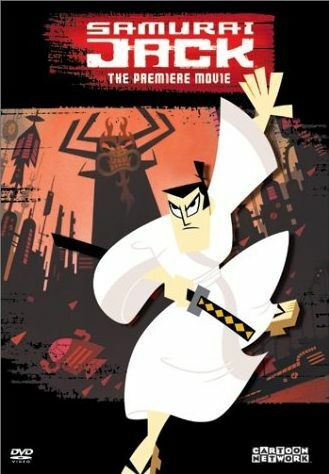 Notice: Samurai Jack is not Japanese animation! It is a cartoon produced in the US. However, because it has a style that is somewhat influenced by anime, I have decided to include it on this site. If you're one of those hard-core anime purists who can't stand seeing a non-anime series on a site dedicated to Japanese animation, then just press the Back button on your web browser and pretend like you were never here. "Long ago in a distant land, I, Aku, the shape-shifting Master of Darkness, unleashed an unspeakable evil... But a foolish samurai warrior wielding a magic sword stepped forth to oppose me. Before the final blow was struck, I tore open a portal in time and flung him into the future where my evil is law. Now the fool seeks to return to the past and undo the future that is Aku!" And so begins the many adventures of Samurai Jack, a prince stuck in the future like a fish out of water, but he only has one goal: the destruction of the malevolent demon Aku. Unlike his time, the future is a strange and new place where Aku has dominated the world. The future is far from friendly. He meets many enemies who seek nothing but Jack's destruction, but with his sword (passed down from his family) he can cut through the strongest opponent and obstacle. Will Jack make it home to his time and ultimately rid the world of Aku?